Clothing brands, albeit subtly, make sure they launch their black collection as the month of Muharram nears. In this capitalist world, everything is for sale. Every season, every holiday, every occasion can be commercialised. Christmas Day sales, Black Friday, Thanksgiving sales, Diwali discounts, Eid collections; you name anything and there will always be a person making money off of it. In Pakistan, Eid and Ramazan are probably the most celebrated occasions, no surprises there since this country is the Islamic Republic after all. As soon as the month of Ramazan closes in, prices of food elevate to another level. From your fruit vendor to your butcher, everyone demands more money. And then there are of course those gazillion iftar and sehri deals. This carries on to Eid, when clothing brands start releasing their ‘never-seen-before’ Eid collections. However, all of this, as unfeasible as it is for the consumers, makes sense overall because of the celebratory nature of these festivals. However, what doesn’t make sense is when this ‘collection craze’ makes its way into the month of mourning. As Bari Eid season ends, the Islamic calendar sees a new beginning. Muharramul Haram marks the beginning of the Islamic New Year; however, it also reminds us of a great sacrifice. Around the world, the Shia sect mourns the loss of the Prophet’s (pbuh) family almost 1400 years ago. It is a month to remember them and their sacrifice to save Islam. When we think about Muharram, we picture people wearing black clothes; the colour for us is symbolic of grief and simplicity. However, what we do not think of is people making money off of someone’s grief. Unfortunately, Muharram collections have now become a trend. Clothing brands, albeit subtly, make sure they launch their ‘black collection’ as the month of Muharram nears. They of course don’t blatantly label it as made for Muharram, but the timing and the colour does make one wonder about the connection. And unsurprisingly, we fall into their trap and buy from them, encouraging them to do the same thing next year. Not only are these collections launched, they are properly advertised on billboards and in magazines, and even have separate racks in stores. Since there is a certain demand for these clothes, brands make sure they are profiting from this by raising their prices. As a Shia, I do see the necessity of having black clothes for Muharram to be worn throughout the period and specifically for majlis. However, buying them as a sheer necessity is different than buying it exclusively from designers or brands for the sake of looking different and being the best in the gathering. The whole purpose of the sacrifice made by Imam Hussain (ra) and his family was to promote simplicity, innocence and brotherhood; however, I feel the whole essence of Muharram is somehow lost now. We like to think of black clothes as a dress code for majlis. The idea was never to show off any extravagant clothing and dressing, in fact it is to learn the lesson of sacrifice and generosity, to help the needy, oppressed and people in pain. It’s actually a protest against the brutal massacre of the Prophet’s (pbuh) grandson and his family. Indulging in this commercialisation seems disrespectful to the concept of mourning. As women, I believe one of the greatest sacrifices for us is to give up our desire for materialism (clothes) but, unfortunately, I don’t see that happening. The events of Karbala should have been a lesson for us and encouraged us to be better people, however, these brand collections have diverted our minds and faith somewhere else now. Such concept of brands launching Muharram collections was never witnessed before, the maximum one would do in dire need of clothes was to go to Aashiyana and buy simple black material to get it stitched. However, now we see fully embroidered shirt collections, in different designs and there are even ones with chiffon dupattas. While I agree that brands have to cater to the needs of their customers, I still believe there must be a certain code that should be followed in order to give respect to these days. These days are to mourn the loss and should not be treated as a festival. ‘To each, their own’ is a concept that should generally be practiced, but I feel that if these brands were a bit more respectful, we need not have a problem with this. Instead of launching black clothes as a collection and advertising them endlessly before Muharram, they could just simply put them on racks, just like other clothes, for people who would need them. And instead of pricing them such that one has to sell a kidney to buy them, they could price them a little more feasibly, so it does not feel like they are feasting off of this month. 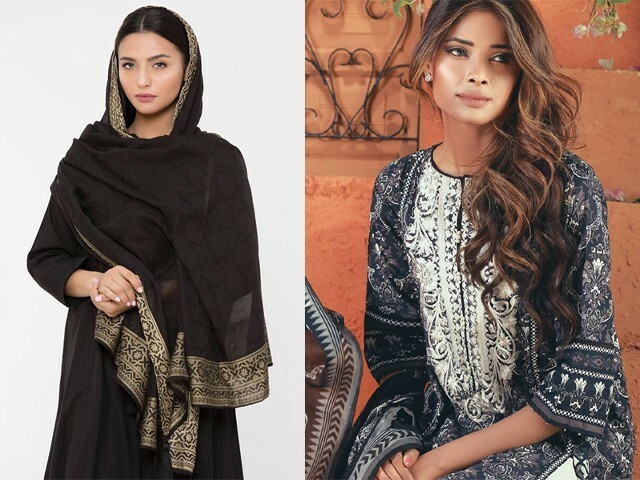 Moreover, to preserve the essence of this holy month, they could perhaps refrain from lavishly designing their black collection and maybe take a simpler approach. As consumers, we too have certain responsibilities and are equally to be blamed. All of us must maintain and serve a sense of responsibility towards this sacred month, where we must try and kill our worldly desires and think of the huge sacrifices that were made for Islam in the event of Karbala. If today we have started accepting this, tomorrow we might end up doing a lot of things which would affect the sanctity of this month, hence, we must sit and comprehend now until it’s too late. Appreciable.. Loved each and every word of your blog. Fizza, you do a great job, in trying to raise the awareness level for Shias and Muharram. The reverence, the grief are paramount. As ever, kudos to you. You do it well. It is a consumer driven society, world wide. As long as there are consumers for black designer’s clothes, during Muharram, believe it, people will flock to their favorite store, designer boutique or fashion house outlet. Be it a black Gucci bag, or black kurta shalwar from Dolce and Gabana. Or coal black high heels from Monolo Blahnik or Fendi or Versace. brag, that their ashes are directly from Paris. Rome? Milan? Also, designers, sellers, have to advertise. After all, they invested money, had tailors and seamstresses sew them, plus shipping, transport etc. and whatnot. Simply hanging them on racks quietly, will not do. They have to make a profit. Recover their money. Look at it this this way, they provided jobs or created jobs too. It’s pure commercialism, and you cannot escape it. And of course you are entitled to your opinion and viewpoint. By the way, went for ziarats, to Najaf, Karbala, Samarra, in May [cool weather]. It was an amazing, unique experience! If you have not done this, put it immediately on your ‘to do’ list. Saw each and every shrine and places of significance. Like the stream Furat. Lots of Iranis were there, Bahrainis, Indians, Lebanese, some Saudis, no Kuwaitis or Emeratis. I don’t agree with you. The entire purpose of having pret wear is convenience. With brands launching monochrome pret wear collections, women that need black clothing are facilitated. Imagine having to go around looking for clothes that are black, and finding only colourful ones. How would you feel? It would seem highly insensitive and ignorant on the part of brands to not understand and respect consumer needs. Being a Shia, I am extremely grateful that brands are catering to my needs. It is actually quite convenient as I would not have otherwise had the time to go around buying black cloth to have clothes specifically stitched for the occasion (which, btw, is also buying — and we all do it to prep for Muharram outfits — making this no different). Only one disagreement. Severe disagreement. Muharram IS NOT A FESTIVAL. Very frivolous and wrong choice of words. gave him a decent burial, immediately after the battle. The others were not allowed to be buried, for days, on Yazid’s order. You used a lot of words,…to say NOTHING. Must be the ‘waller’ instinct in you.